What I loved about the 90’s when I was a teenager was picking up a bodyboarding magazine and finding the “How To Section.” This is my little kick-back and attempt to write a “how-to.” I hope you enjoy it. And to be honest I had the flu for 2 days and needed something to do. I forget when I seen the first rollo take off, it could have easily been in Blast Off Phase 3 or one of Tom Boyles old school videos; which till this day I love. Ever since then I have fallen in love with this old school move. (I’m hoping not to offend any of the old timers, but I’m feeling old myself these days.) However for all the youngsters out there, and looking for some different perspectives and a different adrenaline rush, I recommend the old school rollo take off. I only say old school, because I seen it done a lot back in the day, and now days I don’t see many attempting it. I remember thinking “First things first, learn how to do an Air Rollo, and then Rollo take off” and in this case and for future reference please learn how to do an air rollo before attempting a roll take off in shallow shore break. If anything my advice would be that you are so comfortable with an air rollo, that you can do it “on-demand.” This means the same as your tv, if you want it, you got it. When you want to do an air rollo, it comes naturally and comfortably and on-demand. Most pro’s and competitive riders know what this is all about. If you ever seen a contest in poor conditions and riders still seem to find a way to do an air rollo or even ARS, this is what I mean by on-demand. With any maneuver, wave selection is crucial. Rollo Take off’s are best performed on steep vertical waves, in this case shore breaks are the best. The more steep and vertical the wave is, the better. If 90% of the waves are barreling at the break, this would be prime to try your luck at the rollo take-off. 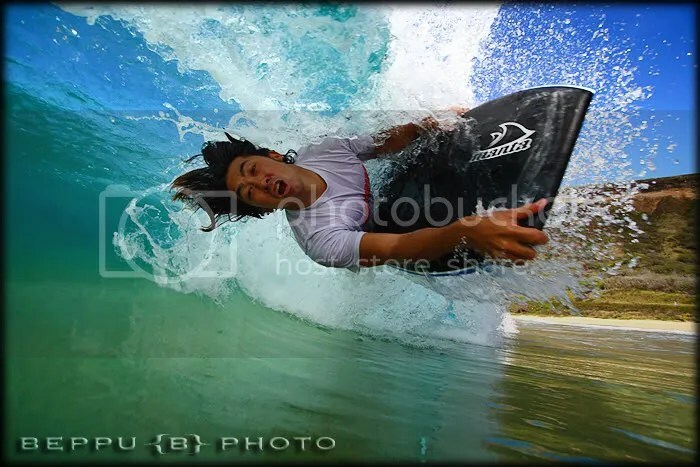 I have chanced my luck at reef breaks and luckily gotten away alive, however I would suggest somewhere safe and soft. When selecting a wave to roll take-off, you will be close to the impact zone, if not you will be directly in it. For me what usually happens is I’m paddling out from the last wave I caught or I’m in the zone strategically. Timing is key. Timing the wave is probably going to be one of the hardest parts in learning to roll take off. There are a couple of things that could happen, either you roll too early and end up in the lip and getting thrown over the falls. Or you roll too late and end up getting creamed the same way. Either way, you usually end up going over the falls and in worse case scenarios going head first into the sand or reef. Usually the roll happens at the last mili-seconds of the wave throwing over. Going it over and over in my head I can’t come up with a real way to time it, because every break and wave is different. This timing needs to be learned by trial and error. Position your body like you are already riding the wave however your body is pointing a tad more to the ocean and less to the beach. This way you will have more control over your body and board when getting thrown over. You have NO speed, but the wave movement itself, so positioning your body is crucial. In the first shots, you can kind of tell my body didn’t start 100% horizontal but in a slight angle. None. You have to project some speed with your fins to get into the face of the wave. Now that you are upside down and looking at the sand or either closing you eyes and hoping for the best, your legs are going to play a huge factor here. This is where your legs can get tangled up and destabilize your transition from being upside down to right side up. In the first picture, my left leg acts like an anchor and thrust, I use it to push off and to keep me stable on the wave. My right leg is used to slow me down and keep me from flipping to quickly. Spreading your legs as you probably guess keeps my body from flipping instantly and keeps me locked into the wave. Never bail when upside down, its self explanatory, it’s like a bmx or motocross person bailing on a back flip when upside down, it never ends pretty. When you feel its time to flip over use your legs and body at the same time to start. Some will say lead with your head and your body will follow, but luckily for me I can’t do a rollo take off on a left to save my life, hence why I have been entranced on what I’m doing wrong on lefts. (Call me Zoolander, excluding the really really ridiculously good looking part) And for one thing I know it doesn’t work that way because I have gone over the falls a million times on lefts. When I use only my body, my body gets stuck in the lip or my legs actually get twisted on the flip. So for the flip, start to cross over your legs and at the same time start to flip your body over, be careful not to over rotate, because the wave is throwing you over, so your body will flip naturally. It’s just keeping your body stable and slowing down the movement. If you flip too quickly or go to fast, get ready for some extreme washing machine beatings. Try to slow yourself down in order to reduce the amount of impact on the landing. If you managed not to get tangled up or get tossed and you even slowed your body down for the landing. The landing may come easier then you expected. Most landings are actually pretty soft, because of the explosion of the lip coming back up. Since you are in the lip and flipped over, the explosion is a counter from the free fall and can act like a pillow when landing. Now remember the whole time your body was relaxed, don’t be fouled and tense up your whole body now, instead get ready for any landing and use your board as a spring and try to imagine landing on a pillow, soft and gentle. It’s probably the craziest time to even imagining landing soft, however you maybe surprised on the landing if done right. Right as you land, your body may feel like it is going for another rollo take-off, this is when you need to be like a rock and if any case slide out on purpose in order to counter balance the twirl. Once you feel stabile you may lean forward a little and actually project yourself forward. 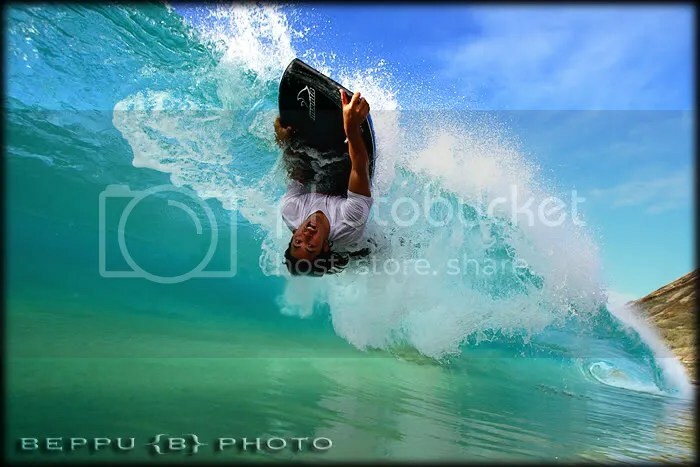 I have ridden waves out of the barrel from rollo take-offs, of course its rare, but it doesn’t stop me from trying. Furthermore, the pounding from the wave will turn into a close out barrel, instead of a spiraling twirl of death. Use your own judgment if you want to stick it out and ride the wave. This one I Turned too Late and got smashed. Keep in mind the total amount of time to do a roll take off will probably be 1 Second, however when completing the move, time will stop. This is why most people do extreme sports, because things happen in milliseconds and every movement and taught process counts. Like any extreme sport, learning how to fall properly is probably just as important as doing the move itself. Skateboarders know when to bail and how to fall on solid concrete, snowboarders know how to fall on snow, wake boarders know how to fall in the lakes, motocross know how to fall on dirt and so should bodyboarders know how to take a beating. This is probably a whole another 101, however I will stress learning how to bail, when to bail, and how to fall is extremely important. Sometimes I like to paddle out and just get demolished from the biggest wave, just to get an understanding of how to fall and where to fall. 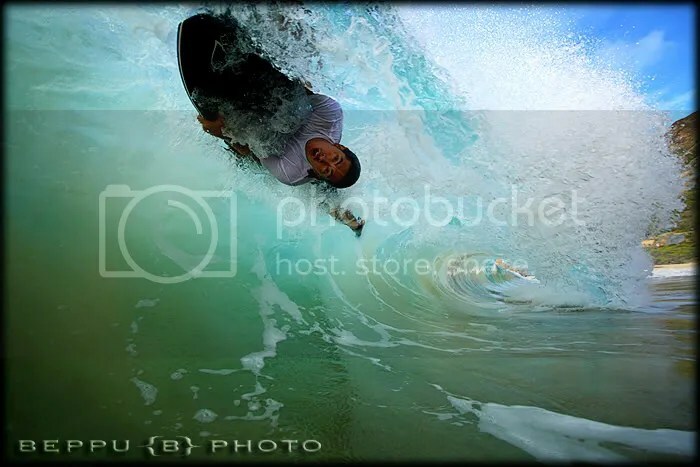 However I would never do this at a reef break, only in a shore break.